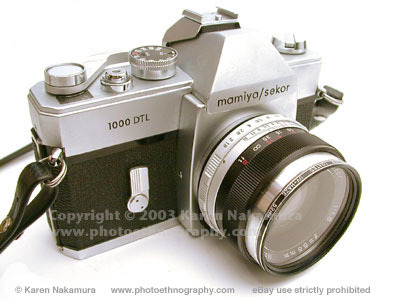 The 1000DTL was released in 1968 by the Mamiya Camera Company of Tokyo, Japan. 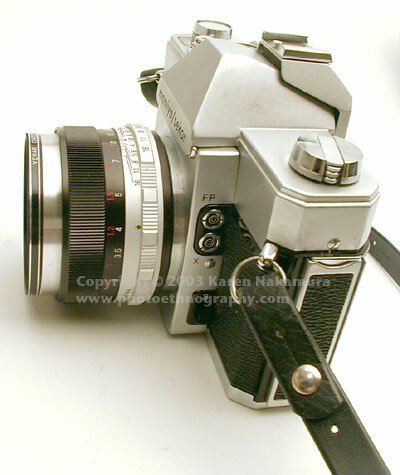 Mamiya is famous for making the RB67/RZ67 medium format cameras that are the standard cameras of fashion photographers. 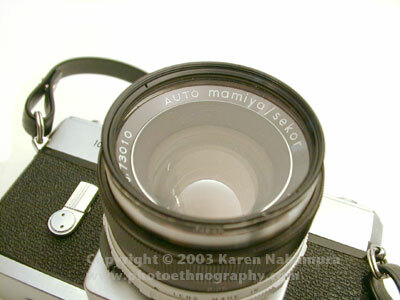 The 1000DTL is an improvement over the 1000TL, which along with the 500TL, was Mamiya's first 35mm cameras with through the lens (TTL) exposure metering using a CdS cell. If you compare Mamiyas with other cameras in the same period, the Miranda Sensorex or Pentax Spotmatic for example, you'll see that Mamiya was technologically very advanced. 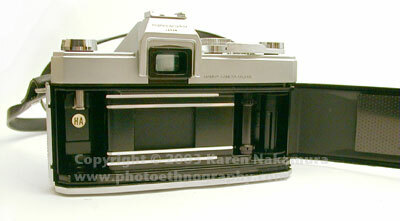 The 1000DTL uses the very popular Pentax/Praktica M42 screw mount. It was replaced by the 2000DTL which came out in 1971 and which sported a 1/2000 sec. maximum shutter speed. The Mamiya cameras were innovative but Mamiya didn't have the energy to combat the aggressiveness by which Asahi Pentax was starting to come out with screw mounts. Asahi soon became the market leader and Mamiya withdrew their 35mm SLRs and focused on medium format. But.. but... there's always a but... I can't seem to get the meter to work. OK, given this is my first (and maybe last) 1000 DTL.... I know that you're supposed to pop out the wind lever and then push it back in, but still nothing, kaput, zilch. There's no response. Switching the spot/average meter switch doesn't do it. So...... maybe the batteries in my test kit are bad... maybe I'm an idiot... maybe there's corrosion inside or loose lead.... or maybe I'm an idiot..... anyway, I ended up selling this camera. The 1000DTL has match-needle exposure metering. It's normally powered by a 1.5v MS76 button battery (aka LR44/SR44 easily bought at any drugstore or camera store). You turn the meter on by pulling the wind-lever forward until it's in its 30° "ready" position. You then meter by pushing the wind lever forward. This stops down the lens and activates the metering circuitry. You can return the wind lever to the normal position by pushing the button on the top of the winding lever. The 1000DTL is unique in having both center-weighted average as well as spot-metering. I believe it's unique in having this, although I could be wrong. For a while, they literally had a patent on this feature. There's a switch on the side of the camera that switches between the two modes. 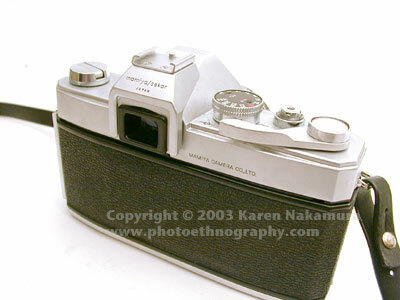 Mamiya started making cameras during the War. The Mamiya Six folding bed was apparently the first. 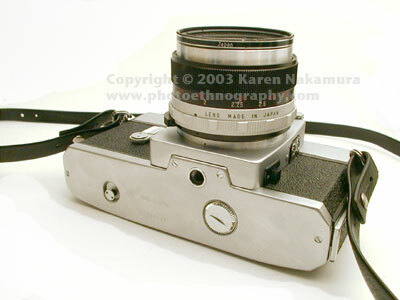 The "Six" refers to the 6x6 medium format size of its photos. These cameras and the brethren the Mamiya 7 are still very much in demand as Mamiya early on mastered high grade optics. Right now, Mamiya is part of a larger conglomerate that makes everything from high tech golf clubs to electronic data systems. 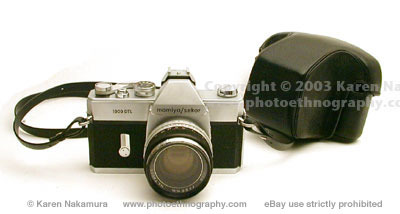 They used to have a 35mm SLR line, but this was discontinued sometime in the 1980s. The popular models are now their medium format systems: the Mamiya 6 and 7 rangefinders and Mamiya RZ67 rotating back medium format camera. Mamiya has recently made the jump to medium-format digital with their 645AFD, which is apparently rather well regarded. Since I'm non-digital, I wouldn't know. Last modified: Friday, 07-Jan-2011 15:39:45 EST , [an error occurred while processing this directive] .